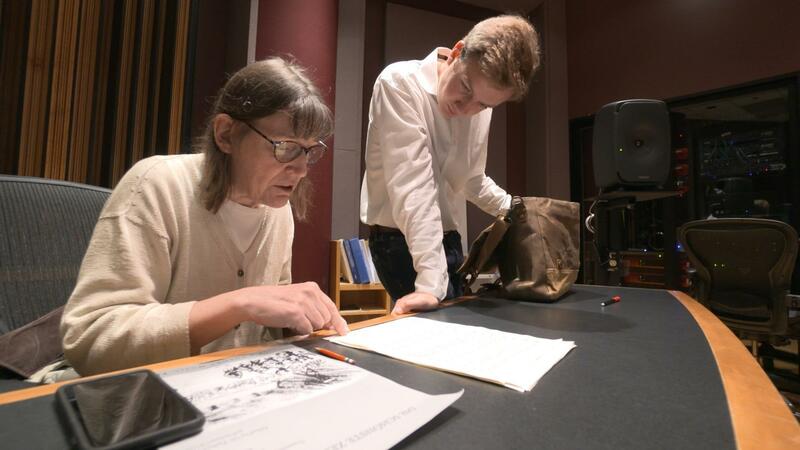 Professor Patricia Hall and graduate student Joshua DeVries discuss the music manuscript for "The Most Beautiful Time Of Life" at University of Michigan. Deep in the archives at the Auschwitz-Birkenau state museum, professor Patricia Hall found something unexpected, manuscripts of music arranged and performed by prisoners in the Nazi death camps. Now one of those songs has been recorded by an ensemble at the University of Michigan, where Hall is a professor. Patricia Hall joins me now from the campus. Welcome to the program. PATRICIA HALL: Thank you very much. GARCIA-NAVARRO: So before we hear this song, which we will do, can you tell me a little bit more about what led you to the archives and what you found there? HALL: Yes, certainly. So initially, I decided I would just go and take a look at the card catalog, see what was there. And I was immediately, extremely surprised by some of the titles I was reading of popular songs like "Sing A Song When You're Feeling Sad" or the title of my foxtrot, "The Most Beautiful Time Of Life." And I just couldn't imagine what titles like that were doing in a death camp. GARCIA-NAVARRO: So you saw this and thought, what is this? And then what happened? HALL: Yeah. So I was particularly drawn, for some reason, to "The Most Beautiful Time Of Life," and I think it was because it seemed the most ironic of all. So the next time I visited the archive in Auschwitz-Birkenau, I asked to see this manuscript and saw that they were carefully written-out parts in ink by three prisoners. So it occurred to me - since I'm a professor at a very large school of music, and we have wonderfully talented musicians and conductors here - whether it might be possible to make a recording for the archive and to have a performance - so, in other words, to give a voice to this manuscript. GARCIA-NAVARRO: This piece, of course, has been recorded. And I think we should hear some of that now. GARCIA-NAVARRO: It's so light. It's so upbeat. It is, you know, extraordinarily hopeful. It speaks to something about the human spirit, I think. HALL: Yeah. It absolutely does. And even that these musicians working under the most awful conditions imaginable could produce music like this - I mean, it still gives me chills to listen to it, I must say. GARCIA-NAVARRO: I understand you've been able to identify two of the three men who did the arrangement. HALL: Yes. I was very lucky in that, for some reason, these two men signed their prisoner numbers. So from that information, I could learn the names of these prisoners. And also, each of them had very, very distinct handwriting. So when they copied out parts for other pieces, even if they didn't sign their prisoner number, it was very apparent that it was them. GARCIA-NAVARRO: What do you know about the third man? HALL: He's a bit of a mystery. And I would love to know who he is. I was immediately very moved by the little bird that he drew out of musical symbols on the trombone part. So I've been studying the handwriting of various prisoners in the Auschwitz 1 orchestra and also even trying to contact some people to see if I can possibly identify who he is. GARCIA-NAVARRO: And what would these musicians have been experiencing? HALL: Yes. Yes. Exactly - where these musicians were spared and didn't have the horrendous conditions of the other prisoners in terms of selections and so forth. But, in fact, many of these musicians did die. And there was one particularly sadistic SS member in the camp who would take out member after member from the orchestra, take them to Block 11, the execution block, and shoot them. GARCIA-NAVARRO: Patricia, I imagine it was so hard to do this research, just emotionally taxing going back and looking at some of the archives of, you know, this terrible, terrible period. HALL: Yes. It's true. And you're actually in the archive working in a former block, in Block 25, where the musicians slept. And the original tile floor is still there. So as you walk through that gate - arbeit macht frei and all the others - you're experiencing a lot of the same things or seeing a lot of the same things that these musicians experienced. GARCIA-NAVARRO: Incredible - how do you feel now that you found this music, and you've been able to give it voice? HALL: I feel very happy. And I must say the thing that makes me happiest is just hearing it. I mean, it's one thing to study something in an archive. But it's quite another to, as I say, give it a voice, give it life - all that - the way the Contemporary Directions Ensemble has. And it's such a wonderful piece. It's almost euphoric. HALL: And I never would have imagined, just looking at this manuscript, that it could have sounded so beautiful. GARCIA-NAVARRO: Patricia Hall, music theory professor at the University of Michigan, thank you very much. (SOUNDBITE OF CONTEMPORARY DIRECTIONS ENSEMBLE'S PERFORMANCE OF "THE MOST BEAUTIFUL TIME OF LIFE") Transcript provided by NPR, Copyright NPR.